The latest Captain America has the honor of being the sequel to two different movies: The First Avenger and The Avengers. My head hurts. Steve Rogers a.k.a. 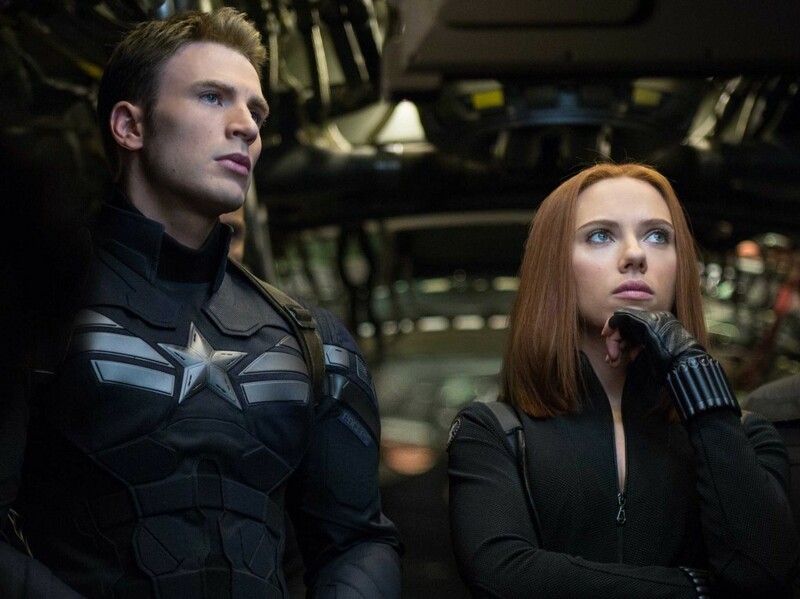 Captain America (Chris Evans) is now a full-time agent for the government agency S.H.I.E.L.D., working with Black Widow (Scarlett Johansson) to bring down all existential threats. Trouble is afoot in the nation’s capital, and nobody is to be trusted. I know this because Nick Fury (Samuel L. Jackson) says “don’t trust anybody” multiple times (I tried to count), in case you forgot that this is a movie and bad things are supposed to happen in movies. While the first Captain America was a send-up killin-Nazi World War II films, The Winter Soldier takes place mostly in the present day, and is more in line with paranoid, post-911 political thrillers. I really liked the first Captain America even though others did not. It had a Raiders of the Lost Ark vibe to it: very inspired by the past, and very much into taking itself seriously while also acknowledging its own silliness. Winter Soldier only seems committed to doing that sometimes. With its undertones about N.S.A. surveillance, The Winter Soldier fancies itself as an allegorical comic book movie of Dark Knight proportions. Hey, at least it tries. However, there are some more interesting aspects of the Captain America mythology that transcend current events, such as Captain America serving as a symbol of hope to uplift an entire frightened army, and also to sell a lot of war bonds. However, the two films have made this idea into something of an afterthought. It will get to that as soon as it finishes telling you how this one scene totally relates to Agents of S.H.I.E.L.D. The Winter Soldier is essentially two different films, with one half being better than the other. Besides one great car chase, the first half is bogged down by exposition. Every time somebody is about to do something, they have to take a break from what they are doing to explain why they are doing it. The more it tries to elevate its plot, the more The Winter Soldier becomes a great, big muddle. But then, after a few plot twists in a row, The Winter Soldier does something that the normal blockbuster usually fails to do: it surprises you. It settles the difference between two separate timelines and mixes them with a tinge of Cold War paranoia. First and foremost, this is an action movie, and once everybody stops explaining things, The Winter Soldier delivers. This was one of the few times where I actually regretted not shelling out a few extra bucks for IMAX 3D. The Russo Brothers, perhaps known best for their work on TV comedies such as Arrested Development and Community, were an odd yet fun choice to helm The Winter Soldier. Captain America: The Winter Soldier is just part of the movie that I wanted to see. There are high stakes and tension, as well as an awesome performance by Robert Redford. However, to get to all of that, you have to slog through a muddle that is completely unsure of itself. Winter Soldier is a mess that only works sometimes. For the future, I hope Marvel works on separating its individual heroes from the universe somewhat. While I love world-building and characters who step out of their respective films and into another, it would be great if Marvel’s films could hold back a little bit and let the characters grow just as much as the mythology. There’s a very small Pulp Fiction reference. Look closely. It’s brilliant. No, I don’t know why Garry Shandling is in this either. There is a part where Captain America and Black Widow have to hide out at Sam Wilson’s (Anthony Mackie) house. They say that they aren’t safe outside. He says it’s cool. It is almost exactly like a scene from Zoolander. I really wish they could have brought Loki into this. Speaking of which, I should probably watch the Thor movies now. With all of these crossovers, I have been trying to imagine if there were Disney-Marvel crossovers, given that Disney owns Marvel. So far, I have two: Elsa from Frozen is asked to join The Avengers; The Daily Bugle goes digital so they hire Dog With A Blog to be their new web editor. So much of this movie looks like it was shot on Google Maps. with a heavy use of Google Street View. Superheroes could probably defeat villains much faster if they didn’t spend so much time uploading stuff to hard drives. Now, how much longer until Guardians of the Galaxy comes out?